A photo from the Florida Sentinel Bulletin dated Nov. 21, 1961. Courtesy of Hillsborough County Public Library Cooperative. 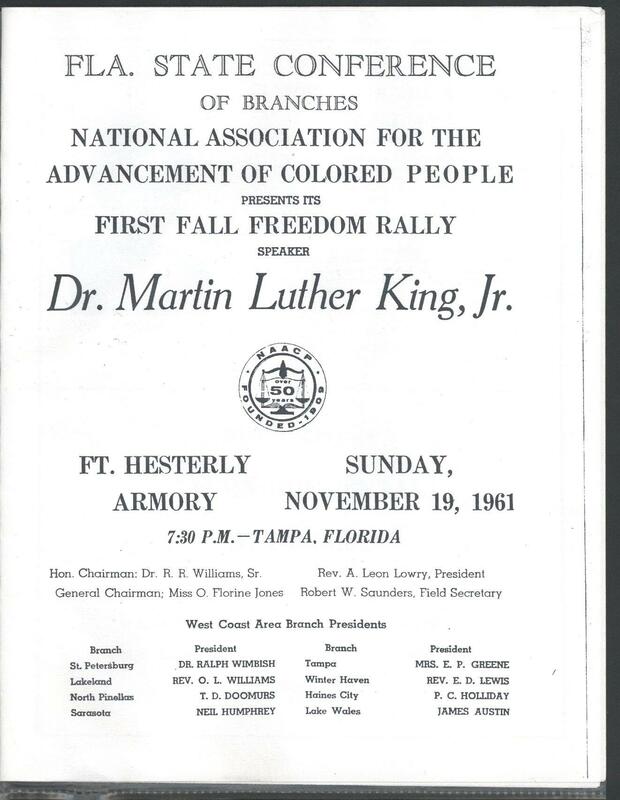 A copy of the program from Dr. King’s appearance at the armory. 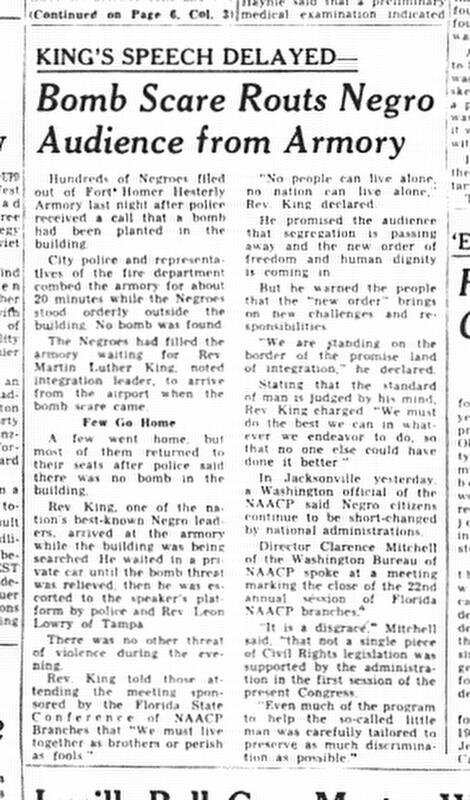 An article from the Tampa Times dated Nov. 20, 1961. An article from the Tampa Tribune dated Nov. 20, 1961. An article from the Florida Sentinel Bulletin dated Nov. 21, 1961. Clarence Fort, left, reminisces at the Fort Homer Hesterly Armory with Rodney Kite-Powell of the Tampa Bay History Center. Fort, now 74, was 21 when Dr. Martin Luther King Jr. spoke at the armory in 1961. Tampa Bay History Center curator Rodney Kite-Powell, left, speaks with civil rights activist Clarence Fort at the Fort Homer Hesterly Armory. The Fort Homer Hesterly Armory, which in its heyday also hosted concerts by Elvis Presley and the Doors. Vacant for nearly a decade, the building is being renovated for use by the Tampa Jewish Community Center and Federation. Civil rights activist Clarence Fort recalls Martin Luther King Jr.'s Tampa visit with Rodney Kite-Powell of the Tampa Bay History Center. Before the late Dr. Martin Luther King, Jr. received the Nobel Peace Prize, became Time magazine's "Man of the Year" or gave his famous "I Have a Dream" speech, he gave a different speech -- in Tampa. 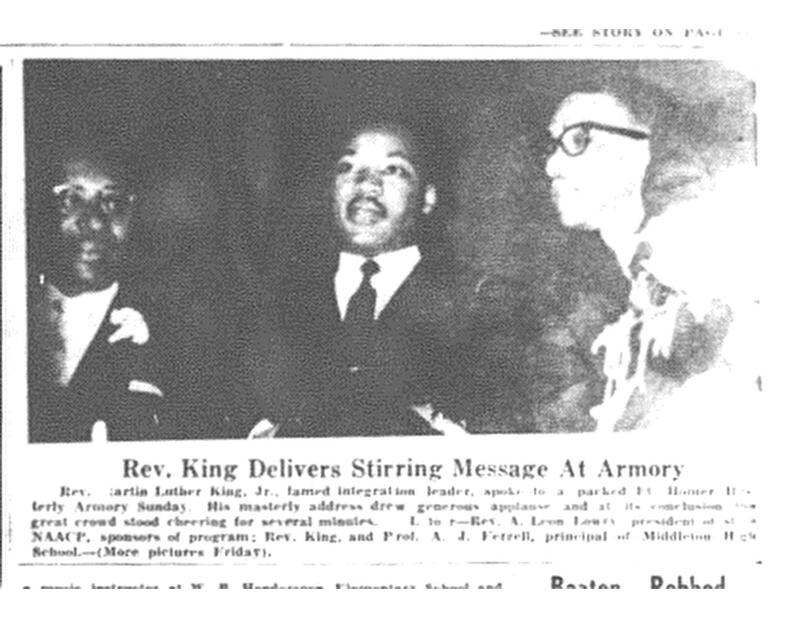 On Nov. 19, 1961, King spoke at Fort Homer Hesterly Armory on North Howard Avenue. At the time, Tampa resident Clarence Fort was a leader in the NAACP’s student chapter. More than five decades later, Fort returned to the now-vacant armory for a conversation with Rodney Kite-Powell of the Tampa Bay History Center. Eric Deggans wears a lot of hats: Tampa Bay Times media critic. NPR contributor. One of Ebony magazine's Power 150 -- a list of the country's most influential black Americans. In his new book, Deggans embraces a title given to him by Fox News pundit Bill O'Reilly: race-baiter. 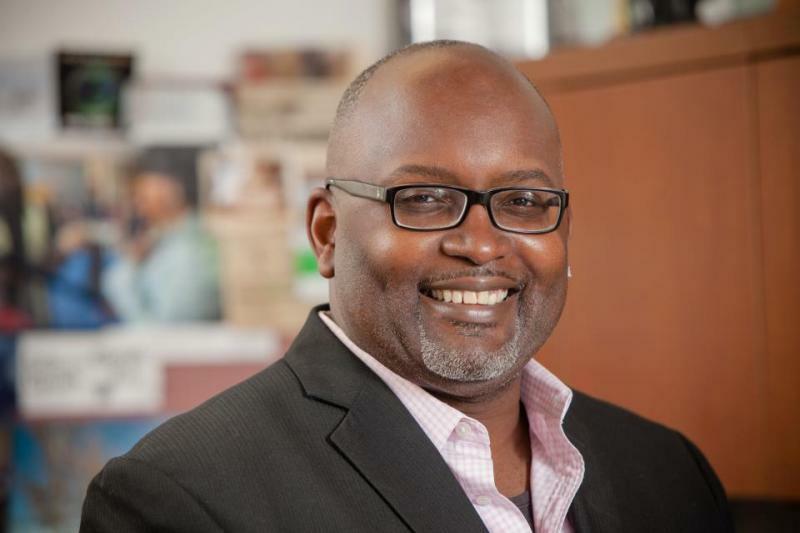 Deggans recently chatted with WUSF about the book, Race-Baiter: How the Media Wields Dangerous Words to Divide a Nation.